If you compare the highest mountains east of the Mississippi River, twelve of the top twenty are located in North Carolina, and one, Chestnut Bald (elev. 6040 ft.) is right here in Transylvania County. 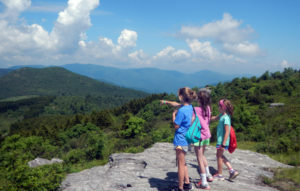 Many of these peaks are accessible from the Blue Ridge Parkway, a wonderful scenic drive that winds along the ridge lines of the southern Appalachian mountains in NC and VA through tunnels, over bridges, and by scenic overlooks for 469 miles. Today, Clyde loaded up a bus of Juniors and Middlers to reach the Parkway and hike a bit exploring one of the highest peaks nearby, Black Balsam Knob (elev. 6214 ft). As you can see from this photo, the weather for this trip was spectacular, sunny and mostly clear, making the long range views incredible. Stopping on one of the weathered-grey outcroppings of rock to point out a distant feature (like Shining Rock, for example), means being so high up, you literally look down on just about everything. With puffy clouds almost close enough to touch, it’s a little disorienting, but also the kind of thrill that makes for a memorable day out. 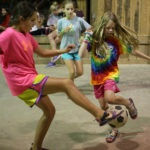 One of the activity options girls can select at Rockbrook is called “Sports and Games.” It includes field sports like soccer, softball, and kickball, and field games like tag, frisbee, and badminton. It can also be gym sports like basketball, volleyball, dodgeball, and hockey. Today the sports instructors Reesa and Adina organized an indoor soccer game in the gym, a fast-paced game where the ball can bounce off the side walls. 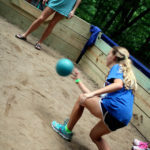 Similarly, another game being played a lot lately (partly because we introduced it this summer) is Gaga or “Ga-Ga Ball.” It also is a ballgame played by strategically hitting a ball off the court’s (or pit’s) walls, only using your hands instead of your feet. In fact, just the opposite of soccer, in Gaga, if the ball hits your foot or leg, you are out. The goal is to hit the bouncy ball around the octagonal pit without letting it hit you. Hit the other players with the ball while avoiding being hit yourself. It’s really fun, and the girls are very much into it. Play continues until only one person who has avoided being hit is left. The awesome weather held at camp too, making the lake a very popular place during the first Free Swim period before lunch. Free swim allows girls who aren’t signed up for swimming during their regular activity slots to come down and enjoy the lake, perhaps by showing off goofy jumps from the diving board, setting a record for the most trips down the water slide, or just floating on an inflated tube in the sun. At noon, which is when this free time happens, the sun is directly overhead making the whole waterfront warm and attractive (buffering nicely the chilly water of the lake!). 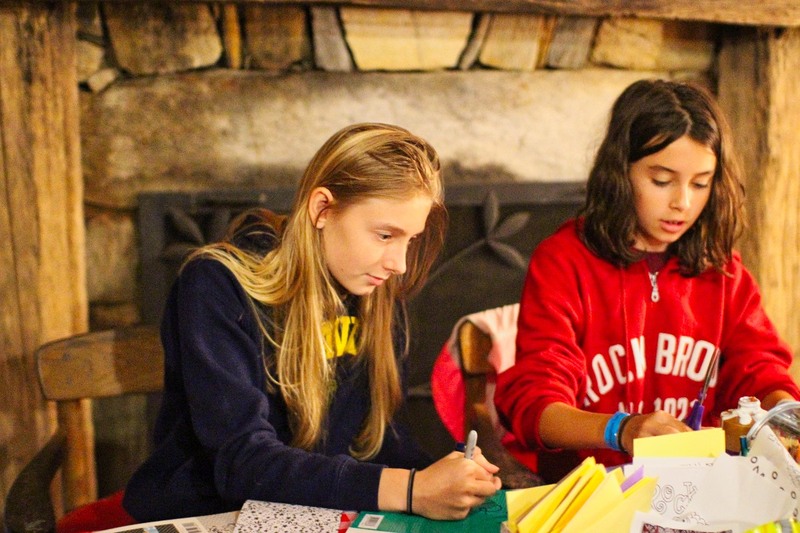 This block of free time before lunch also gives the campers a chance to spend time finishing a craft project they began during one of their classes. 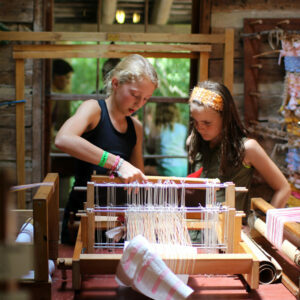 For example in Curosty, the fiber arts cabin, the looms seem to never rest. It takes time to weave a good piece of fabric, so campers are often slipping back in to complete what they started. Some very impressive work is coming off those looms. 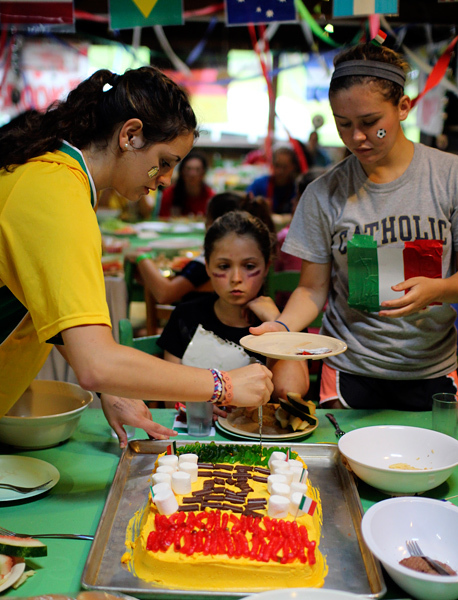 To celebrate the World Cup soccer tournament currently taking place in Brazil, we turned dinner tonight into a “World Cup Party.” Replica flags from different countries decorated the dining hall, and the girls came dressed “as their favorite county,” “futbol fan,” or really anything with an international flair. 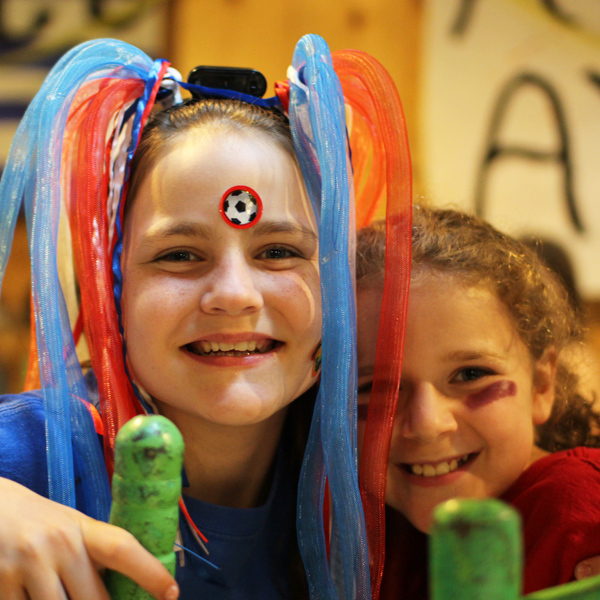 Instead of sitting in their regular cabin groups, the girls sat according to a table they selected at random when they arrived in the dining hall. Chase had a music playlist pumping out upbeat world music (e.g., “Waka Waka,” and “Wavin’ Flag”), and Rick served us an all-American meal of hamburgers with all the trimmings and watermelon on the side. But the highlight of the meal was the dozen or so cakes Katie baked for us, each decorated colorfully like a different country’s flag (e.g. Spain, Great Britain, and Italy, for example) using candy and icing. The girls had a grand time singing along with the music, dancing at times and sharing all of the cakes for dessert. Well, yesterday I spoke too soon, bragging a bit about our great timing in the midst of this unusually wet weather pattern, for today was a truly rainy day. We had rain overnight, rain this morning during breakfast, during rest hour, and except for an occasional break, all afternoon and into the evening too. I suppose we should have expected it, with the forecast using “100%” to describe the chance of precipitation, and that green/yellow/orange color on the radar maps all the way down through Florida. Still, when it comes to your raincoat, or what around here we call a “dew coat” (rain is just a “heavy dew,” right? ), it feels odd to need it all day long. You might think flooding would be an issue with all this rain, and that would be correct for the French Broad River, which has now crested its banks and has turned many local sod and corn fields into expansive lakes. Rockbrook though, with the exception of a few of our horseback riding fields, is high above the flood zone, set on the hill between Dunn’s Rock and Castle Rock. For us, this kind of heavy rain swells our creeks creating more powerful, rushing waterfalls. Over many years, we’ve learned to channel this water, and send it strategically through pipes and down various gutters and ditches. The camp facilities do quite well, even with this much rain… almost 4 inches today total. Wow! Our camp people are quite well too. 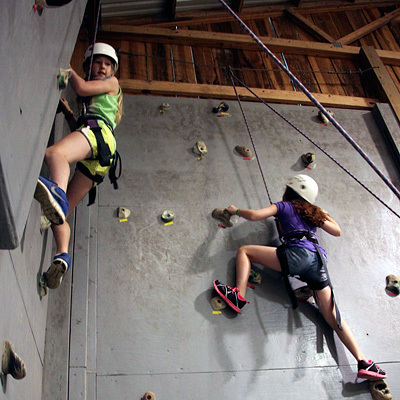 Beyond the fact that most of our activities can carry on either because they are suited to being indoors, in our gym, on a porch, or one of the stone lodges or activity cabins, or because they can be reshaped to happen inside (climbing our indoor wall instead of the Alpine Tower, for example), there is something about our “outdoor lifestyle” at camp that makes rain almost irrelevant. Living outside most of the time, we grow used to being a little wet, a tad bit muddy, and cool enough to wear long sleeves at night. We actually enjoy hearing the rain on the roof at night, feeling the warmth on our hands from a fire in the lodge fireplace, and snuggling in our cozy cabins. This weather… Although I’ll admit a little less of it would be nice! … seems like a natural part of our camp experience. While the sky might be crying, at Rockbrook, we aren’t sad we’re getting wet. 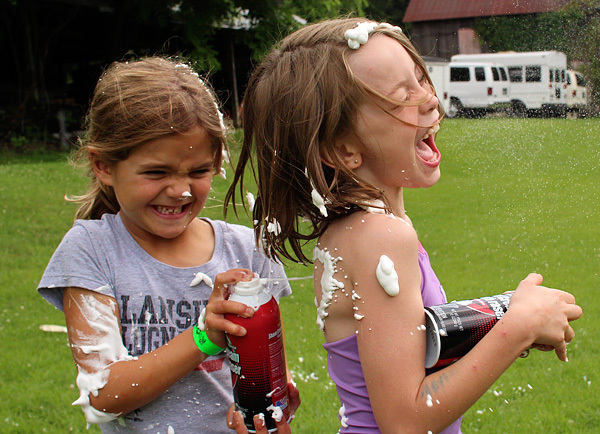 When you’re a little wet already, one idea is to celebrate it, and get even messier. That’s exactly what about half the camp chose to do this afternoon when we pulled out the slip-n-slide and a dozen cases of shaving cream. With only the occasional slight drizzle overhead, the girls attacked each other with foam spraying. They painted each other with the stuff, drawing designs on backs, “six packs” on stomachs, and twisting extreme hairstyles. 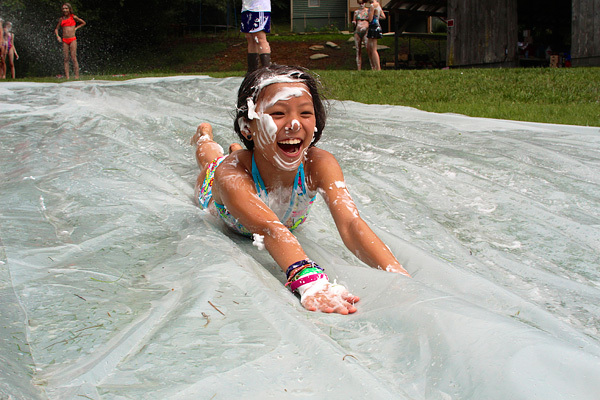 Being covered with slippery shaving cream also makes for quite a ride down a wet sheet of plastic. This is the kind of mischievous fun, in this case that’s surprisingly sanctioned, that’s also completely hilarious. 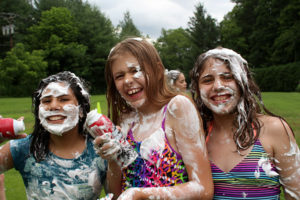 The girls, and quite a few counselors too, laughed and laughed as they got messier and messier, pausing once in a while to slide down the hill on their stomachs or knees. 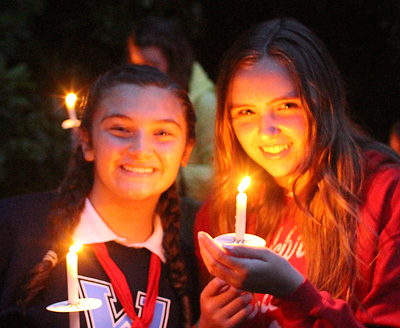 Tonight was the last night for our first July mini session girls, and also the night of their closing “Spirit Fire” campfire. The rain made holding the program inside the Hillside lodge a good idea. 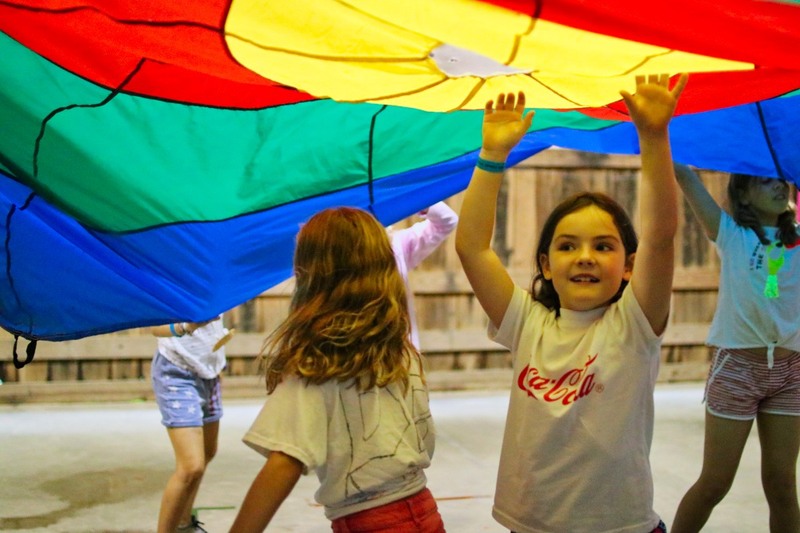 So with a huge fire roaring in the fireplace, all the mini session girls and their counselors spread out on the floor in Crazy Creek chairs to sing traditional camp songs and hear tributes to all the successes of the session. 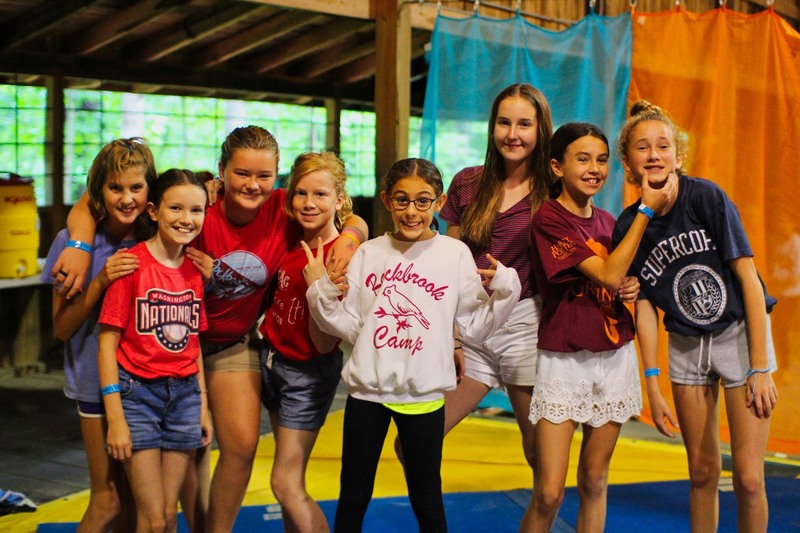 Several girls from each line (Juniors, Middlers and Seniors) stood and spoke about their experience at Rockbrook, what they learned, the friends they’ve gained, and why they love camp so much. In the same way, both new and returning staff members made remarks. Sarah always speaks at the end of our Spirit Fires, and tonight she reminded us about how “the ‘Spirit of Rockbrook’ inspires kindness and generosity,” and how she hoped everyone would carry that spirit home with them. The small candles everyone lights at the end of the program likewise represent the “Spirit of Rockbrook.” With their candles lit, the girls formed a circle on the hill to sing one last song. It was a gorgeous sight… misty mountains looming in the background, dim blue hazy sky overhead, and the warm yellow glow from more than one hundred candles… All these girls and young women bonding in this special way, in this special place. Walking around camp, you can’t help but notice how busy —the enthusiastic kind of busy— everyone seems to be these days. 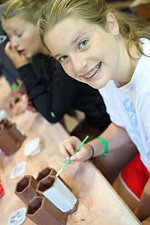 All kinds of craft projects, for example, are taking shape: tie dye T-shirts unfolding to reveal their colorful patterns, woven mats unrolling off the looms in Curosty, glaze being carefully painted on ceramics pieces, and new bracelets showing up in campers’ mailboxes as surprise gifts from a “secret buddy.” There’s lots of physical activity too: tennis serves and volleys, archery and riflery targets with plenty of new holes, sweat- (and laughter-) inducing games of dodge ball in the gym, and impressive gymnastics exercises that require some real strength. 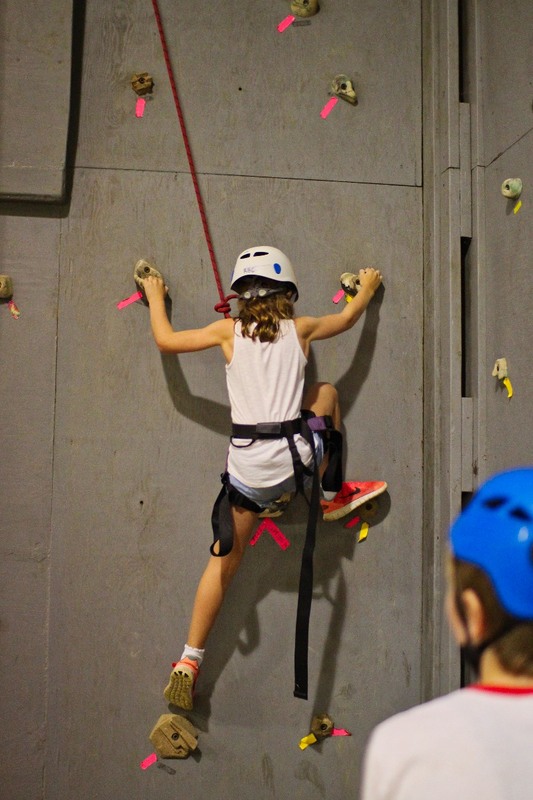 With all this cool Nature around us, we’re ready for outdoor adventure also, with girls climbing the Alpine Tower and Castle Rock, canoeing and kayaking in the lake, and practicing their fire building techniques in the WHOA (Wilderness Hiking and Outdoor Adventure) activity. Each morning after the first activity period, we all pause for a “muffin break.” It’s almost a race to swing by the dining hall and pick up one of Alison’s freshly baked muffins, and it’s definitely a topic of conversation to find out what flavor she’s made on a particular day. It could be something classic, like “poppy seed,” or something original like “chocolate chip sprinkle.” Today we had “pumpkin spice.” It’s neat to see girls just grab a warm muffin and chomp right down on it, no matter what the flavor. They might not have selected it by name, like from a menu, but at camp, they just dig right in and would probably be surprised to know they’ve eaten and enjoyed something with pumpkin in it! Speaking of food, the kitchen has been getting quite a few thank you notes recently. Campers and counselors alike are feeling compelled to express their love for the food Rick and his crew are serving us. It takes a lot of work to produce homemade meals for 300 people. Imagine hand dipping sliced green tomatoes to fry for the lunch sandwiches, or kneading by hand 35 pounds of flour and butter to make the biscuits this morning, or preparing 200 pounds of barbecue chicken. Rick also makes an extra effort to stock local fruits and vegetables: this week serving corn, cucumbers, tomatoes, blueberries, bell peppers and peaches. The knowledge and care he brings to the food really comes through and everyone at camp benefits. So yes, we’re busy (again, in the best sense of the word) around here, and we eat really, really well! Today I think we set a new record for bringing campers to Sliding Rock. 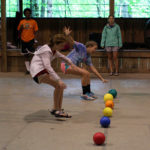 We started with a small group of about 25 mini session Seniors and their counselors by packing a picnic lunch and heading into the forest around noon. In the bright sunshine and over the roar of the falling water, the girls had a great time screaming their heads off sliding down the chilly ride. Later, around 5:30pm, we loaded up all of Rockbrook’s Middlers, which turned out to be a huge group of 95 people once we got all of the counselors and lifeguards in the equation! We headed straight for the Rock, and fortunately found it mostly deserted so we could all slide plenty of times. Many of these Middlers had never been to Sliding Rock before making this an even bigger treat for them. An hour or so later, we gathered everyone again and drove to our favorite picnic area in the forest, a special spot ideal for large groups. The girls were probably most excited about our last stop, however: Dolly’s Dairy Bar. “This is the best place in the world!” one camper yelled as we pulled into the parking lot. It certainly is the only place where you can order a cone of “Rockbrook Chocolate Illusion,” which might be a little over the top, in all its chocolate glory (but probably not!). 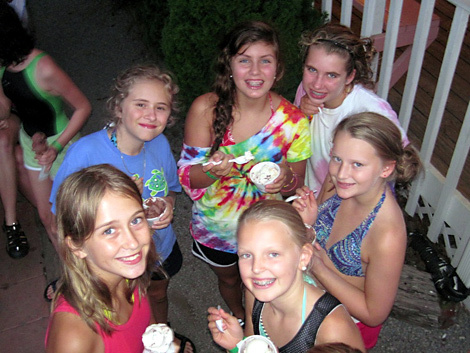 Combine this many girls with this much ice cream and you’ve got a grand time. I have to say it was a little late, and definitely dark by the time we arrived back at camp, but I didn’t hear a single complaint or even comment about that. 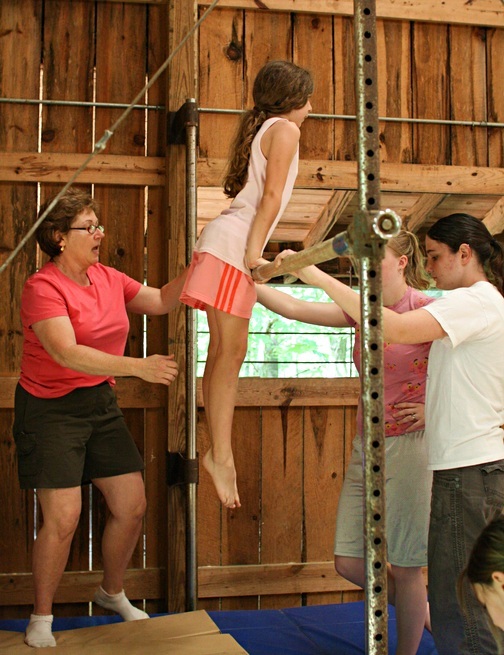 Elaine Trozzo is returning this summer to head our camp gymnastics instruction program. 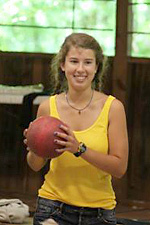 Elaine has taught gymnastics for the Transylvania County (NC) Parks and Recreation Department for 14 years. She has coached a competitive gymnastics team for 3 years, and has served as a gymnastics competition judge for 4 years. She has been certified by USA Gymnastics and holds the National Safety Certification in gymnastics. 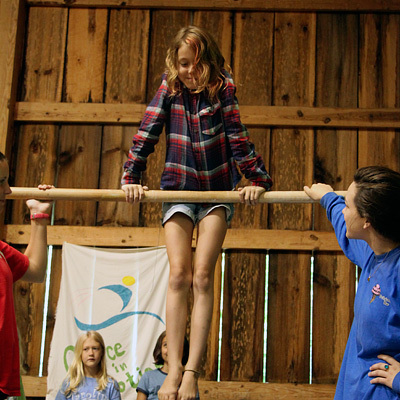 This will be Elaine’s sixth year as the head of Rockbrook’s camp gymnastics instruction. Also returning are some of our awesome gymnastics counselors from camp last summer. You’ll see Karen and Abby down at the gym. We’re also happy to introduce Jess Watrin. 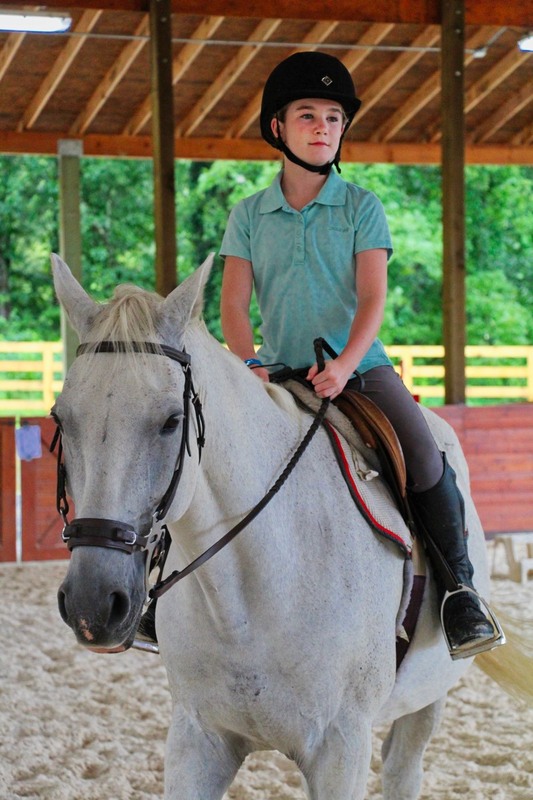 She has many years of gymnastics experience and will be one of our gymnastics main instructors.